It is a prominent town of Shekhawati region and is a district headquarter. The town was founded in the mid 5th century A.D. It is well connected by rail and road. Magnificent Palaces, splendidly painted Havelies, temples with colourful old paintings, placid Lakes, Darghah and Historical ruins are the main places of interest. One interesting monument is the Khatri Mahal (the Wind Palace) dating back to around 760 A.D.
Rail: The place is connected by rail with Jaipur. Road: Good road connections. Mandawa: Situated at Jhunjhunu of Shekhawati region in Rajasthan. It is founded in the 18th century, this medieval fort dominates the town with a painted arched gateway adorned with Lord Krishna and his cows. The Chokhani and Laldia havelis and the street with Saraf havelis are some of the splendid examples of this region’s havelis. A Shiva temple with a rock crystal ‘Lingam’ is also worth a visit. The fort is now converted into a heritage hotel. Nawalgarh: Founded by Nawal Singh of the Shekhawat clan, this is the town where the finest of Shekhawati’s frescoes can be seen. Its Havelis bear witness to the rich and prosperous Marwari era of the 19th century. Nawalgarh has hundreds of painted Havelis and a fine clock tower of British period. Mukundgarh: Known for its fine havelis, the fort is now a heritage hotel. Bagar: Home of the Rungtas, Bagad was founded by Nagar Pathans in the mid 15th century A.D. It has a reservoir built by the Ojha family. 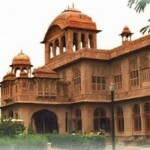 Pilani: Some temples and a havelis museum are located here. An institute named as Birla Institute of Technology and Science is also located here. Surajgarh and Kajara: Surajgarh has an impressive 18th century fort, painted temples and havelis while some beautiful 19th century havelis can be seen in Kajara. Mehansar: Founded in the mid 18th century, the “Sone-Chandi ki haveli” and Raghunath temple with beautiful paintings resembling the Bikaner school of art are worth seeing. Alsisar and Malsisar: Founded in the late and mid 8th centuries respectively, this town lie at the northern age of Shekhawati. The angular style frescoes in various colour make the trip to these towns a memorable one. Bissau: Founded in the mid 18th century, Bissau has splendid “Chhatris” of its “Thakurs” and finally painted havelis. Chirawa: Chirawa is situated 29 km from Jhunjhunu. A popular trading town between Churu and Loharu in Rajasthan, Chirawa is famous for huge havelis. Of particular interest are the havelis of Nand Lal Dalmia, Phool Chand Dalmia, Tara Chand Dalmia, Mangal Chand Dalmia, Duli chand Kakrania & Nemanis. Kakrania and Poddar wells are also worth visiting. Dundlod: Dundlod is situated around 42 km from Jhunjhunu and 38 km from Sikar. It has a rugged fort and a palace now run as a heritage hotel. Havelis of the Gounka family ornate with fine frescoes are a visual delight. Fathepur: Fatehpur is a historic town, which is situated 48 km from Jhunjhunu in Rajasthan for was once ruled by the Muslim Nawabs. It is a treasure – trove of beautiful frescoes. The frescoeson the Devra and Singhania havelis are on outstanding combination of India and Western styles. This entry was posted in Jhunjhunu, Rajasthan and tagged Alsisar and Malsisar, Bagar, Bissau, Chirawa, Dundlod, Fathepur, jhunjhunu city, Mandawa, Mehansar, Mukundgarh, Mukundgarh Fort, my jhunjhunu, Nawalgarh, Pilani, Shri Ranisatiji Mandir, Sone-Chandi ki haveli, Surajgarh and Kajara. Bookmark the permalink.